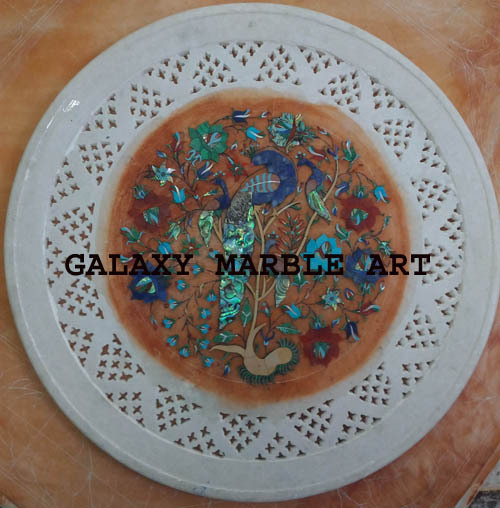 We have a marble inlay Factory in Agra,India with a team of skilled crafsmen GALAXY MARBLE ART creates unrivalled objects in marble of great aesthetic beauty, which we sell throughour factory and on internet worldwide. The inlay work idea is from TAJ MAHAL in AGRA,INDIA. This inlay work is of top quality which is used for decoration in Taj Mahal by mughal Emperor ShahJahan in Agra and other areas where Mughal ruled during 16th and 17th Century. We also reproduce old Pietra Dura Italian designs table tops mainly in black marble and can also be made in white marble for which we use Indian Makrana marble. We also make custom designs in inlay for which we use many semi-precious stones like lapis lazuli- blue(Afghanistan) Malachite-green (South Africa),cornelian-orange (India), turquoise–sky blue (Iran),Amethyst, Agate,jasper-brown (India),onyx, shell. All these items are extremely popular as Home decor items,not only in India but all over the world. 2.Inlaying the stones in marble. Besides the inlay items which we make in our factory we also work on sights. MAKING OF A PLATE 14"
First the stones are shaped and placed on marble and then the outline is taken and that outlined portion is engraved and the stones are fixed. Red color is used to see the outline for engraving which goes away on polishing.